The Bose ProFlight Aviation Headset is the industry's smallest, quietest and most comfortable active noise cancelling communication headset. With an on-head weight of 4.9 ounces, the new Bose ProFlight Aviation Headset is designed for long term comfort and is our most innovative headset yet. Engineered for pilots of moderately noisy pressurized turbine powered aircraft, it incorporates more than 30 U.S. utility and design patents. 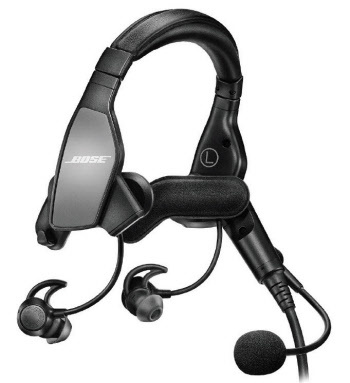 The ProFlight Aviation Headset features three levels of user selectable active noise cancellation, active equalization to improve intelligibility of incoming transmissions, a noise cancelling microphone for clearer outgoing transmissions, talk-through tap control for communication with those outside the intercom and full function Bluetooth® connectivity with smartphones, tablets or EFBs. The ProFlight Headset is FAA TSO and EASA E/TSO-C139a certified, meets all applicable ARINC standards and is available with four different plug configurations. The ProFlight Headset is ideal where noise is pervasive, comfort is required and communication is critical. · Improved comfort for hours of use, achieved through choice of materials, distribution of weight, low clamping force and dedicated left and right earbuds – all without sacrificing stability. · Incredibly small and lightweight (4.9 oz / 139 g on-head). · Electret noise cancelling microphone for clear transmissions. · Audio optimized with active equalization for enhanced communications with or without an intercom or hot mic system. · Three unique levels of user selectable acoustic noise cancelling providing users with a range of noise reduction to meet their needs in multiple scenarios. · Tap control for talk-through communication. · Bluetooth capable for wireless audio connections to EFBs and mobile phones, with audio prioritization to mix or mute wireless audio with intercom transmissions. · Bypass communications mode provides primary ICS audio with or without power to the headset. · Built to latest ARINC standards and FAA TSO and EASA E/TSO-C139a certified. · Available with twin plug, 5 pin XLR, 7 pin XLR or 6 pin LEMO plug configurations. · Auto-off: All configurations of the ProFlight Headset feature auto-off technology which powers down the headset when not in use and saves battery life. · Side-swappable boom microphone and down cable, no tool required. · Durable and robust design made to endure the wear and tear of everyday use in tough environments. · Three-year limited warranty with acclaimed service. · Auto-on: Certain configurations of the ProFlight Headset will turn on automatically when the avionics master switch is in the on position, using the ship’s power to operate.